According to a University of Texas study, Crazy Ants may become the dominant invasive ant species displacing Fire Ants in the near future. The ants secrete a compound that neutralizes the venom used by Fire ants. The venom of the fire ant is very powerful and even fatal. It is two to three times as toxic as DDT on a per weight basis. But because crazy ants have a natural defense against the venom and their sheer numbers, they can overcome the species in a head to head confrontation. Crazy ants gained attention when Texas exterminator Tom Raspberry noticed these ants in a Pasadena chemical plant in 2002. He noticed that the species seem to keep multiplying even after extermination. The ant colonies seem to have an unexplained attraction to electrical devices. Crazy ants are known to damage devices such as televisions and laptops. The ants will stream inside the device until they form a single moving mass that completes a circuit and shorts it. They take over an area through sheer numbers. These ants can overtake beehives and destroy the colonies. Bird chicks are smothered and struggle to hatch. In South America, where scientists now believe the ants originated, they have been known to obstruct the nasal cavities of chickens and asphyxiate the birds. They even swarm into cows’ eyes. With their natural defense against fire ants, scientists believe that crazy ants will displace fire ants in the Southern United States. Invasive "crazy ants" are rapidly displacing fire ants in areas across the southeastern U.S. by secreting a compound that neutralizes fire ant venom, according to a University of Texas at Austin study published this week in the journal Science Express. It's the first known example of an insect with the ability to detoxify another insect's venom. The crazy ant invasion is the latest in a series of ant invasions from the southern hemisphere and, like its predecessors, will likely have dramatic effects on the region's ecosystems. Known for their painful stings on humans and other animals, fire ants dominate most ant species by dabbing them with powerful, usually fatal venom. A topical insecticide, the venom is two to three times as toxic as DDT on a per weight basis. When a crazy ant is smeared with the venom, however, it begins an elaborate detoxification procedure, described for the first time in this study. The exposed crazy ant secretes formic acid from a specialized gland at the tip of its abdomen, transfers it to its mouth and then smears it on its body. In lab experiments, exposed crazy ants that were allowed to detoxify themselves had a 98 percent survival rate. This chemical counter-weapon makes crazy ants nearly invincible in skirmishes with fire ants over food resources and nesting sites. "As this plays out, unless something new and different happens, crazy ants are going to displace fire ants from much of the southeastern U.S. and become the new ecologically dominant invasive ant species," said Ed LeBrun, a research associate with the Texas invasive species research program at the Brackenridge Field Laboratory in UT Austin's College of Natural Sciences. Last year, the researchers reported that where crazy ants take hold, the numbers and types of arthropods — insects, spiders, centipedes and crustaceans — decrease, which is likely to have ripple effects on ecosystems by reducing food sources for birds, reptiles and other animals. They also nest in people's homes and damage electrical equipment. 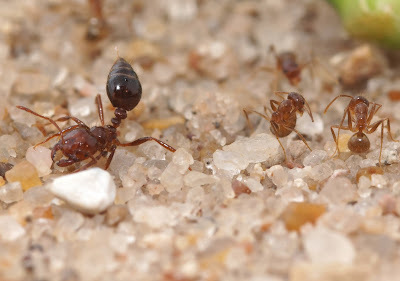 LeBrun described watching a battle for food between red fire ants and crazy ants along the boundary between their two populations at a Texas field site. The fire ants found a dead cricket first and were guarding it in large numbers. Usually when fire ants amass around a food resource, other ants stay clear for fear of their deadly venom. "The crazy ants charged into the fire ants, spraying venom," said LeBrun. "When the crazy ants were dabbed with fire ant venom, they would go off and do this odd behavior where they would curl up their gaster [an ant's modified abdomen] and touch their mouths." It was then that LeBrun first suspected the ants were somehow detoxifying the fire ant venom. Experiments back at the Brackenridge Field Laboratory in Austin helped him and his colleagues identify the detoxification agent and measure its effectiveness. To test the effectiveness of the formic acid, researchers sealed the glands of crazy ants with nail polish and put them in vials with red fire ants. Without the ability to apply the detoxifying compound to themselves, about half of the crazy ants dabbed with fire ant venom died. Among a control group of crazy ants with unsealed glands, on the other hand, 98 percent survived. Crazy ants and red fire ants are both native to northern Argentina and southern Brazil, where their ranges have overlapped for a very long time. The researchers suggest this newly discovered detoxification behavior is the result of an ancient evolutionary arms race. It's still not clear how formic acid renders imported fire ant venom nontoxic. One possibility is that it prevents the venom from penetrating the outer layers of a crazy ant's exoskeleton. Apart from human intervention, said LeBrun, the only thing stopping the relentless march of the crazy ants will be natural factors, such as arid soils or severe freezes, that will be too harsh for them to survive. Like the fire ants before them, their range will ultimately be determined by geology and climate. There is one bright spot for humans. Unlike fire ants, colonies of crazy ants spread very slowly — about 600 feet per year. The only way they can spread long distances is when transported by people in potted plants and recreational vehicles. LeBrun suggested that people not buy plants if they see ants nesting in the pots and that if they live in areas already invaded by crazy ants, they check for stowaways when they move homes or travel long distance. "If you have an RV, inspect the campgrounds you visit before parking for the night," said LeBrun. "If you live in infested areas, don't store food in your vehicles and consider treating your camper with insecticides several days before a trip. Consult with a pest control professional as to the best products to use. Not storing food in any vehicle parked in an infested area is also a good idea."